We are a culture of clichés. A cliché is defined as “a phrase or opinion that is overused and betrays a lack of original thought”. In other words, a stereotype. Consider then, the notion that “Deferred Maintenance” saves money or allows for current operational funds to be used immediately for something other than proactive facility upkeep. “Kicking the can down the road”, a cliché. Deferred maintenance neither saves money nor is often redressed. When it is finally dealt with, it is exponentially costlier than sticking to a budget and preventative plan in the first place. This is especially true with HVAC cleanliness, indoor air quality (IAQ) and system performance. The HVAC system in a building acts like the pulmonary system in the human body in that it responsible for the “respiration” of the indoor environment, providing the exchange of fresh air. We humans spend 90% of our time in shared, indoor spaces. Therefore, the health of the HVAC system directly affects the health of a building and its occupants. When HVAC maintenance and especially cleaning is deferred it can lead to a domino effect that impacts the biggest of operational costs to an organization: its people and energy costs! Here are three big statistics to think about. The EPA says that 1 out 4 buildings in the U.S. can be classified as “Sick”. Sick Building Syndrome affects 64 million workers with symptoms like headaches, burning eyes and sinus irritation resulting in lost productivity. Finally, it takes only 3/16 of an inch of fouling across an evaporator coil to decrease the energy efficiency on an air handling unit by 20%! HVAC system cleanliness being ignored or deferred significantly contributes lost productivity and energy. When the HVAC system is fouled performance is greatly affected. The equipment has to work harder to maintain airflow and static pressure which can lead to a more humid environment and more service calls when mechanical failure occurs. The first step for any HVAC Preventative Maintenance program is to have a firm understanding of the mechanical inventory of the building and its performance. This can include but is not limited to: make, model, specifications and age for each AHU, what filters are required, what zones they supply, the current condition of the AHU and ductwork, and the maintenance history. Utilizing the data from a comprehensive mechanical inventory is the cornerstone of HVAC Preventative Maintenance. Building upon that data with regular performance evaluations, as well as Indoor Air Quality testing helps to ensure consistent, clean operations. 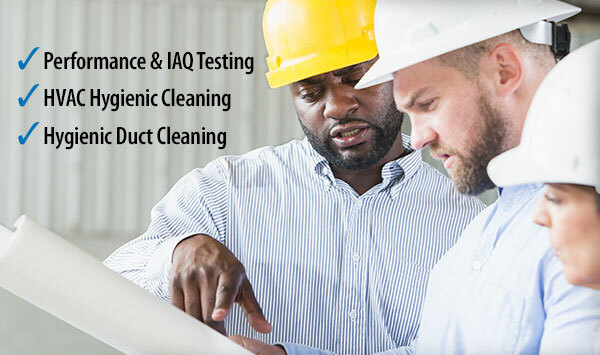 IAQ testing can include everything from microbial (mold and bacteria) and particulate (fiberglass from aging duct insulation) analysis to assessments of thermal comfort and building pressure. Generally, when the performance of the HVAC system degrades everything downstream is also affected. As mentioned earlier, the evaporator coils are an integral part of the HVAC system. Filters are the first line of defense in keeping the coils clean and must be used to spec and be regularly changed. If corners are cut with filtration, the system’s airflow can be lessened causing a chain reaction of performance issues. If the wrong size or configuration of filters are used, then dirt and debris can rapidly infiltrate through gaps to foul the coils. Once the coils are impacted a slew of performance and IAQ issues can occur. It is recommended to have a thorough, deep cleaning of the HVAC AHU, including the coils, every year. A conventional coil cleaning process uses a chemical rinse method that only superficially cleanses the fins. It does not address the fouling deep within the coil, not to mention the rest of the interior of the AHU. PURE-Steam from Pure Air Control Services, Inc. is a top to bottom service that disinfects the entirety of the AHU, and coils. It utilizes high temperature and low-pressure steam to clean completely through the coil form one side to the other. It effectively and safely dislodges years of debris from within the coils to help restore the unit to near specification performance. The final component to a sound HVAC Preventative Maintenance program is to keep the ducts clean. After all, the ducts are what carries the conditioned air from the AHU to the rest of the building! It has been estimated that 1 in 6 people who suffer from allergies do so because of bacteria and fungi in the ducts. The best method for duct cleaning is one that is hygienically focused. Pure Air Controls provides a thorough method that contains the area being serviced from cross contamination and utilizes HEPA vacuums to ensure precise handling of the refuse extracted. Another consideration is the condition of the insulation within the AHU and corresponding ductwork. If the HVAC maintenance has been deferred for a long amount of time humidity can build and cause fiberglass insulation to get damp, sag and begin to break down. These fiberglass particles can then loosen and be spread throughout the building. Pure Air Controls provides solutions to either encapsulate degraded insulation or retrofit with PURE-Cell fiberglass free insulation. Focusing on just these three pillars of HVAC Preventative Maintenance can lead to big gains in system performance and improved IAQ that will ultimately save money for an organization.